A well-paced narrative has a kind of rhythm. Instructors commonly refer to this as “push, glide, push, glide,” as if skating. What that means is that while the characters might be in the midst of chaos, there is order in the layout and pacing of the narrative. These “processing” scenes are transitions, moving the plot forward while allowing the reader to process what just happened. We can’t have non-stop action, as that is exhausting to write and more exhausting to read. The character arc is often at the forefront during these transitional scenes as that period of relative calm is when you allow your characters’ internal growth to emerge. We justify what just happened, making it believable. It is also where you ratchet up the tension. When it comes to writing transitions between scenes, we have several paths to choose from. Introspection offers an opportunity for new information important to the story to emerge. It opens a window for the reader to see who the characters are, how they react and illuminates their fears and strengths. It shows that they are self-aware. Keep the scenes of introspection brief, and go easy on them if you are given to using italics to set them off. A wall of italics is hard to read, so don’t “think” too much if you are using those. Characters’ thoughts must serve to illuminate their motives at a particular moment in time. In a conversation between two characters, introspection must offer information not previously discussed. Internal monologues should not make our characters too wise. Humanize them, show them as a bit clueless about their flaws, strengths, or even their deepest fears and goals. Each character must speak uniquely, sounding like themselves. Don’t dump conversations into a blender and pour out a string of commentary that makes them all sound alike. Don’t get fancy with speech tags/attributions. It’s best for me as a reader when the author avoids words that take me out of the narrative. Some words are eye-stoppers. I recommend you stick with said, replied, answered—common and ordinary tags that don’t leap out at the reader like ejaculated, disgorged, spewed, and so on. Occasionally, you can get away with more forceful tags, but keep them to a minimum. Make the characters’ actions and words show the force of their words. In my opinion, you can do away with speech tags for some brief exchanges if the scene contains only two characters. I’m in two minds about using fade-to-black scene breaks as transitions. Why not just start a new chapter? One of my favorite authors, L.E. Modesitt Jr. sometimes has chapters of only five or six-hundred words, which keeps each character thread truly separate and flows well. Each of the major players has a point of view. Some authors use the aftermath of an action scene as an opportunity to advance the antagonist’s story line. That is a good strategy, as we do need to show why the enemy is the enemy. The key is to avoid “head-hopping,” and I feel like the best way to do that is to give a new chapter to the point-of-view character. Head-hopping occurs when an author switches point-of-view characters within a single scene. It happens most frequently when using a third-person omniscient narrative because the thoughts of every character are open to the reader. My favorite authors will employ all the above listed transitions as they move their characters through the story arc. Each transition will lead us into a new scene, and when they are done right, we the readers won’t even notice that they are transitional. The transition is the most difficult part of the narrative for me to formulate in the first draft. I get stuck, trying to decide what information needs to come out, and what should be held back. Sometimes, a transition just will not work no matter what. This happens when a flaw in the logic exists in the scene preceding it. Usually, I can’t see it at that point, but my writing group will show me what the problem is. This struggle to connect my action scenes into a seamless arc is why writing isn’t the easiest occupation I could have chosen. But when everything comes together, it is the most satisfying job. Detail from: Journey of the Magi (East Wall) by Benozzo Gozzoli 1459, Magi Chapel of Palazzo Medici-Riccardi, Florence, 1459–1461. Wikimedia Commons contributors, “File:Benozzo gozzoli, corteo dei magi, 1 inizio, 1459, 51.JPG,” Wikimedia Commons, the free media repository, https://commons.wikimedia.org/w/index.php?title=File:Benozzo_gozzoli,_corteo_dei_magi,_1_inizio,_1459,_51.JPG&oldid=179731811 (accessed April 24, 2019). Wikimedia Commons contributors, “File:Sir Galahad (Watts).jpg,” Wikimedia Commons, the free media repository, https://commons.wikimedia.org/w/index.php?title=File:Sir_Galahad_(Watts).jpg&oldid=277887181 (accessed April 24, 2019). I hope you had a happy Easter weekend, celebrating the advent of spring your way. We share five children, and they all have children, so warm weather and the addition of extended family made for a great family party on Saturday. Unfortunately, our poor abused vacuum cleaner died the final death before we were finished preparing for the party and there was no time to get a new one. Near the front door, beneath the growing pile of cast off shoes, bags, and backpacks, lay an expanse of unvacuumed carpet. Strangely, no one seemed to notice. By three in the afternoon, my kitchen was loaded with every kind of food imaginable, and the party was in full swing. While the younger children involuntarily were held captive indoors behind closed drapes, the teenagers hid well over a hundred plastic eggs. Each was filled with cash, toys, and candy. Somehow, in the process, the rod holding up my front drapes was pulled loose from the wall. It still hangs there, like everyone’s drunken uncle…precariously positioned and slightly askew. Thunder shook my suburban neighborhood when we released the captives and the front door burst open. Tender shoots of green lawn met a grisly fate as the mob of crazed grandchildren descended on our yard. High drama unfolded as toddlers fell and scraped their knees and older children took advantage of their distraction. Oh, the carnage! At around seven PM, the last car left the driveway. We geared up in hazmat suits and began the cleanup—sans vacuum cleaner. However, I’m a pro. My husband and I are both suffering from back injuries, so in the aftermath, we were forced to be creative. Who needs a stinkin’ vacuum cleaner? My broom works on the carpet, and I have developed mad skills with my new tool of choice—the reach extender. It’s amazing the things you can do with long-handled grabbers. They make excellent tools to extricate candy wrappers from the shrubbery and retrieve the few eggs that were overlooked in the stampede. Being able to grab the toy cars and plastic farm animals out from under the porch is a real plus. Inside the house, wide-spread devastation made negotiating the hallway to the bathroom difficult for travelers in a hurry. Muffled cursing was heard as sock-footed old people stepped on abandoned Legos. I’m talented—I can pick up the merest fragment of potato chip from under a bed with my long handled grabber, without crushing it. This tool, properly wielded, works on every kind of debris—lint, broken crayons, Legos, Polly Pocket purses, Barbie shoes, and half-eaten Cadbury eggs. You can lean on it when you need propping up. We dug a path and cleaned the kitchen before going to bed. But by noon on Sunday, the cleanup had been completed, and the toy room was once again a place of moderate order. Speaking of order, I have ordered a new, sturdier vacuum cleaner, and peace reigns once again here at Casa del Jasperson. Now that the madness of the family Easter rumble is over, I will continue working on my three projects. I have just finished a large editing job for a client but now will get back to work on several smaller editing jobs. I am still working on the final revisions for Julian Lackland and intend to have him ready for publication by mid-July. 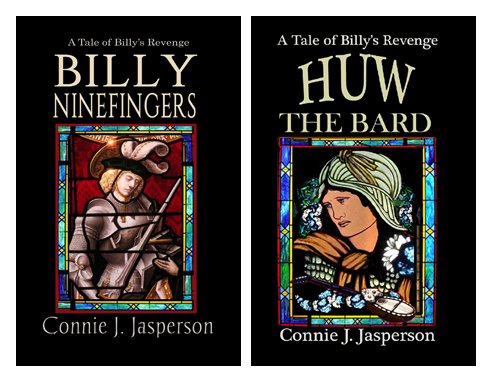 This book is both the final installment in the Billy’s Revenge series and was the original book that the series grew out of. It has been unpublished for seven years and during that time, it has been re-written, expanded, and edited properly. It is about to go to the beta readers. I am also nearing completion of the first draft of a new book set in Neveyah, the Tower of Bones world. For me, in the first draft of any work, long or short, writing the transition scenes between events are difficult to imagine. I think of them as “just” moments: adjust and justify. That sort of thinking takes a bit of mind-wandering, so while I ponder ways to move my characters gracefully from disaster to disaster, I work on other projects. Writing keeps me busy, but the grandchildren are a never-ending source of entertainment for me. Wikimedia Commons contributors, “File:36 inch reach extender.jpg,” Wikimedia Commons, the free media repository, https://commons.wikimedia.org/w/index.php?title=File:36_inch_reach_extender.jpg&oldid=307417600 (accessed April 21, 2019). Many times, the way to avoid predictability in a plot is to introduce a sense of danger early, a response to an unavoidable, looming threat. How our characters react to that threat should feel unpredictable. When you let them act naturally, they will emerge as real, solid characters. In literary terms, “agency” is the ability of a character to surprise the author, and therefore, the reader. If, when you are writing them you know their every response, it can feel canned, boring. Their reactions must surprise you occasionally. For me, there are times when my characters drive the keyboard, making their own choices. Other times, they go along as I, their creator, has planned for them. Ultimately, they do what I intend for them, but always they do it their own way and with their own style. Plotting, for me, means setting out an arc of events that I will then create connections to. Because my characters act independently, the order of events changes. New events are added. My plot outline must continually evolve with them so that I don’t lose control of the arc, and go off on a bunny trail to nowhere. This evolution of the outline happens because as I get to really know my characters, they make choices that surprise me. When I begin planning a new novel, plotting is important because introducing an unavoidable threat early limits the habit I have of writing too much backstory. Plot outlines don’t allow much time for the characters to go about “life as normal” rather than going on an adventure. “Normal” is boring. As they move through the events leading toward the final showdown each character will be left with several consequential choices to make in each situation. Allowing the characters to react to each incident that takes them out of their comfort zone is good. The final event will happen in a situation where they have no choice but to go forward. By that point, their personalities are fully formed. How they react feels natural, because they have been growing as human beings over the course of the story. Consequences are the most important aspect of any story when it comes to the choices my characters must make. I say this because if there are no consequences for bad decisions a character might make, everyone goes home unscathed and I won’t have much of a story. So, while I am an outliner and plotter, I do fly-by-the-seat-of-my-pants to a certain extent. Those moments are beautiful, flashes of creativity that make this job the best job I ever had. Part of being a writer is going through the experience of having your work edited by a professional editor. Submissions that have been accepted by anthologies and publications may require a little editing prior to publication. We do our best to submit a clean manuscript, but none of us are perfect. Editors often use a function of Word that is called “Track Changes” along with inserting comments in the right-hand column. When you are new to this process, it can be confusing. It may make you think he has “mucked up your manuscript” because he may have made changes that are marked in red and which surprised you. Trust me, you have the final say on all changes that have been made, and you can “accept” or “reject” each suggested change. If you reject a suggestion, the text reverts back to your original prose. Just a note: before you submit your work to an editor, you must do what I think of as “Due Diligence.” If you have hired an editor for a novel-length manuscript that was poorly proofed, tracked changes can be distracting, looking like a wall of red. If that is the case, the manuscript probably wasn’t ready for editing. Editors can only do so much – you must submit work that is as clean as you can make it, and they will help you clean up the rest. A good way to catch the majority of typos and dropped or missing words is to use the “Read Aloud” function (on the review tab) or read it aloud yourself. When a manuscript is too rough, some editors will choose to edit only the first few chapters and put most of their suggestions into the comment column rather than using tracking. Editing via keying suggestions in the comment column can be quite time-consuming. They will ask you to consider the suggestions they have made and make revisions in the whole manuscript accordingly, and then resend the ms once those changes have been made. Simple Markup: This shows the final version without inline markups. Red or black markers will appear in the left margin to indicate where a change has been made. When I am editing for a client, I use “All Markup” and add comments as needed. Places where I insert a suggested change will be in red and have a line beneath them. Deleted items will be in red and have a line through them, or in the case of commas, above them. The markup will disappear, and Word will automatically jump to the next change. You can continue accepting or rejecting each change until you have reviewed all of them. When you’re finished, click the Track Changes command to turn off Track Changes. Just click on it, and the dark gray will return to the same shade of gray as the rest of the ribbon. The automatic comments generated by “track changes” will disappear when you resolve the suggested changes. Those will say “Inserted” or “Deleted” followed by the word or punctuation that was changed. If your editor has made separate comments regarding larger issues, such as suggestions to move a section to a different place for continuity, they won’t disappear from the comment column when you accept or reject tracked changes. You’ll have to delete them separately. To delete all comments at once, click the arrow next to Delete, and then click Delete All Comments in Document. This is how a document might look when it comes back from the editor. The left column shows a line indicating a change was made, the change itself is in red, and a comment was automatically generated explaining what that change was. Some authors get exceedingly angry when the editor of an anthology requests some changes in the story they have submitted. Editors have a vision of how the whole book will flow when it is complete, and they may ask for some small changes so that the stories transition well. If the changes are reasonable (and most are), do make them. If you strongly disagree, wait until you cool down before responding. Once you have a handle on your irritation, write a note explaining why you don’t feel those changes are right for that piece. It could be that the editor just didn’t understand where you were going with it, and a few minor tweaks along with a calm discussion will resolve the problem. Google Docs has a track changes function, and I am sure all other word processing programs do too. Their processes will likely be similar to what I have described, and you can go online to find out what the differences are. But Word is the program I use, so I am most familiar with that.